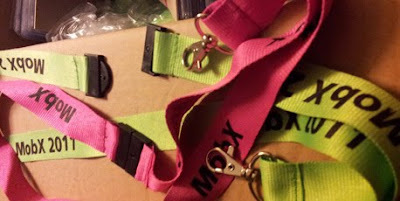 Our MobX lanyards have arrived. Notice the black safety clip? Many conferences try to save money and order cheap lanyards. This can be dangerous though, as it's easy for your badge or lanyard to get caught on something - if that happens and you're lucky, you'll be wearing a safety lanyard like this.